FireTape™ high temperature, heat & flame resistant tape is similar to our firesleeve except it can be installed in situations where tubular firesleeve cannot be used, as when industrial hoses, wires and cables cannot be disconnected to install a sleeve. (our firesleeve with velcro closure is also an alternative). 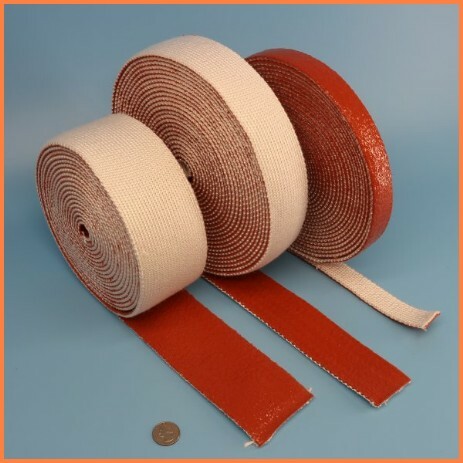 This high temperature tape is the perfect choice for protection of industrial hydraulic hoses and lines, pneumatic lines, fuel & oil lines, brake lines, wires, cables, tube and pipe from exposure to high and extreme heat conditions. The extra thick special formulation of silicone rubber sheds molten metals, slag, welding splatter, electrical or grinding sparks and contamination. This tape also provides protection from ozone, UV and abrasion and provides thermal insulation. This tape is produced in high temperature oxide-red, however it can be painted with our liquid silicone to result in almost any color. Supplied in 100 foot lengths and also available in By-the-foot lengths. This tape is fabricated from a knitted fiberglass (fibreglass / glassfibre) yarn substrate, and is available in 5 standard widths: 1", 2", 3", 4" and 5". Due to the knit construction of the base material, this tape has the ability to stretch slightly across its width, but only minimally in its length. This tape can also be used to wrap complex shapes or varying dimension tapered pipes. Typically, the tape is overlaped by 50% when winding, which provides the entire assembly with stability. Safety wire, band clamps, ties or End Wrap Tape can be used to secure the tape in place after installation.high temperature, heat, flame, pyro and fire resistant sleeve and jacket provides molten splash & weld splatter protection to wires, cables, hoses, tubes and pipes. SnapSleeveä (patent pending) provides a field installable protection sleeve utilizing metal snaps instead of Velcro closure strips.